While Jimmy John's signature bread is so popular that people actually buy day-old loaves of it, ditching the plain white bread for the chain's thick, sliced whole wheat bread has long been an easy way to spice up your go-to sandwich order. 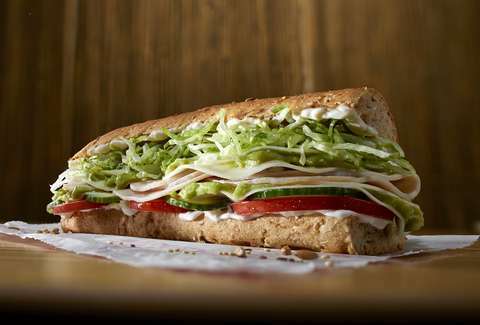 Now, Jimmy John's is adding another bread option to the menu for the first time in decades. After not-so-subtly hinting at it last week, Jimmy John's officially rolled out its all-new 9-Grain Wheat bread on Wednesday, joining the existing French bread, whole wheat, and lettuce Unwich sandwich options. The all-new bread is made with a blend wheat, rye, flaxseed, quinoa, oats, millet, barley, amaranth, and spelt, along with a hint of honey and molasses, according to a company spokesperson. It's Jimmy John's first new bread option in more than 20 years, and best of all, you can customize any sandwich on the menu with it for no additional cost. Jimmy John's built a pop-up store in the middle of a vast wheat field in Binford, North Dakota to introduce the new bread, giving local farmers and presumably surprised residents the first taste. John Shea, JJ's chief marketing officer, said the arrival of the new bread on the chain's menu is the result of feedback from customers. Jimmy John's has been on a roll (sorry) this year with the release of several new menu items, including a giant 16" sandwich, Kickin' Ranch sauce, a sliced version of its "world-famous" pickles, and now, the 9-Grain Wheat bread. And while all of the new stuff is probably exciting for JJ's regulars, we're still waiting for the chain to bring back its Customer Appreciation Deal for $1 subs. Tony Merevick is Senior News Editor at Thrillist and ate a lot of Jimmy John's in college. Send news tips to news@thrillist.com and follow him on Twitter @tonymerevick.